Have you ever wondered why the First Amendment is the first amendment? The Founding Fathers believed that the right to speak your mind, the right to publish your thoughts and the right to peacefully assemble and exchange your ideas with others were the most important of all human rights. Up to that point, governments had infringed on those rights throughout all of human history. The First Amendment is a restriction on the power of government. In the 20th century, however, something new emerged in the form of non-official, paramilitary organizations. In Germany, they were called “brownshirts,” or the Sturmabteilung (SA). They functioned as the original paramilitary wing of the Nazi Party and for a while their leader was Hitler himself. In Italy, they were called “blackshirts.” Similar organizations emerged in Albania, Romania, Mexico, Brazil and even in Canada, Ireland and the United Kingdom. These organizations used violence and intimidation to disrupt meetings, silence speakers, physically assault and sometimes even kill those they disagreed with. Why is this important today? Because a similar threat is reemerging at colleges and universities. Increasingly we are told that speech itself is a form of violence. So, physical violence is justified to silence offensive speech. 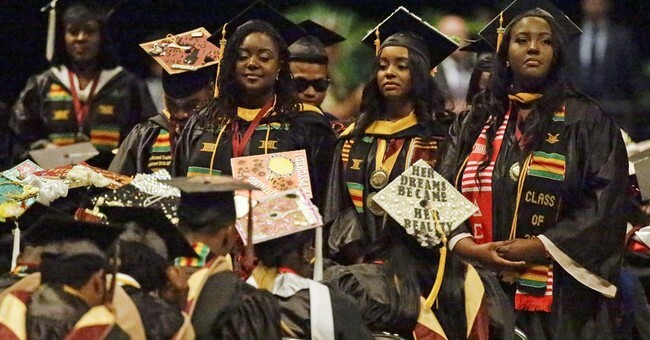 At Bethune-Cookman University in Florida, a historically black campus, Education Secretary Betsy De Vos was interrupted by hecklers and by students and faculty who stood and turned their backs to her as she tried to speak. When author Charles Murray appeared at Middlebury College in Vermont, he was shouted down and forced to flee in a violent confrontation that sent one professor to the emergency room with a concussion. Columnist and talk show frequenter Ann Coulter still hasn’t been able to speak at Berkeley, where a speech by the provocateur Milo Yiannopoulos was cancelled after masked protesters smashed windows, set fires, and pelted police with rocks. At Claremont McKenna College, researcher Heather Mac Donald was forced to live stream her talk to a mostly empty auditorium by college officials who were threatened with similar acts of violence. But isn’t college supposed to be an experience where students are exposed to new ideas that challenge conventional ways of thinking? And isn’t the First Amendment designed to protect “offensive speech”? Whoever heard of a society that tried to ban inoffensive speech? Yet, according to the Foundation for Individual Rights in Education, 93% of colleges and universities use “speech codes” to prohibit constitutionally protected speech. Some have pointed out that colleges are becoming propaganda factories, churning out graduates who parrot their professors’ world view. True, but it would be a mistake to think that today’s cultural clashes are mainly clash of ideas. They aren’t. They are about feelings, emotions and identities. If anything, they are anti-intellectual. Charles Murray’s most controversial work is the 1994 book, The Bell Curve, in which he argued that genes might (that’s “might”) be a major factor in determinizing IQ. But if you Google “IQ” and go to WikiLeaks you will find that standard research today is far more positive about this conclusion than Murray ever was. Betsy De Vos has spent a good part of her life trying to help inner city minority kids escape bad schools. What’s wrong with that? Low-income blacks support that idea by 2 to 1. But on college campuses, facts don’t matter anymore than Ideas matter. And this was also true in Germany 80 years ago. A 1941 essay in Harper’s Magazine, “Who goes Nazi?” by Dorothy Thompson, was almost entirely a psychological essay. It had almost nothing to do with formal ideas. In German intellectual society, it was not uncommon to find Nazis who were former communists and communists who were former Nazis. The world views of these ideologies were so similar that transition from one to the other was relatively easy. But out on the street, these ideological distinctions mattered not. The brownshirts (representing the oppressed) violently clashed with communists, unionists, Jews and anyone else they viewed as siding with the oppressors. And it’s not that much of a leap to evolve from the view that your opponent doesn’t have the right to speak to the view that he doesn’t have the right to exist at all. In violent riots, members of the SA shattered the glass storefronts of about 7,500 Jewish stores and businesses, [in what was called] Kristallnacht (Crystal Night). Jewish homes were ransacked throughout Germany. This pogrom damaged, and in many cases destroyed, about 200 synagogues (constituting nearly all Germany had), many Jewish cemeteries, more than 7,000 Jewish shops, and 29 department stores. Some Jews were beaten to death and more than 30,000 Jewish men were arrested and taken to concentration camps. Things are nowhere near that bad in 21st century America, but they are bad enough that columnist Peggy Noonan compared the campus atmosphere to that of a Salem witch trial. What do you expect from the kids, when this is the way the adults behave? We have the right to decide if we want to refuse to sit and listen to the words of a politician who chooses to use his political power in ways that continually harm marginalized and oppressed people. The brownshirts in Germany couldn’t have said it better.